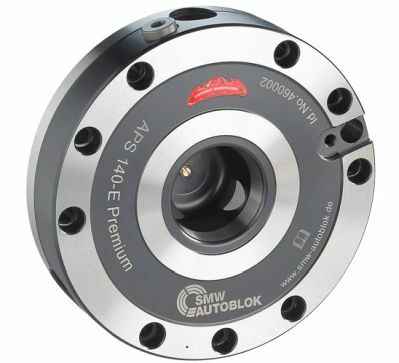 The APS (Automatic Positioning System) is the latest addition to SMW Autoblok's new line of stationary workholding products. The APS is a universal connection between the machine tool, the clamping device and/or the workpiece. The APS can be used in turning, milling, measuring, or grinding operations. With an emphasis on flexibility and speed, users can realize a reduction in set-up times of up to 90 percent. The APS locks into the proper position by lining up a series of pins on the workpiece or workholding with APS bases mounted on the machine. When the pins and bases are locked in, the combination is automatically positioned to the zero point. The APS uses lubricated/compressed air (6 BAR-85 psi) for release, and springs for clamping. No compressed air is required in the locked, or clamped, position, but a turbo function is available when constant air is possible to increase clamping forces. This allows for quick, accurate positioning with exceptional repeatability (< 0.005 mm). The APS is wear-resistant and protected against rust due to heat-treated elements and an extra hard protective coating. As part of the Proofline® series of products, it is fully sealed to protect against dirt and swarf. The built-in air cleaning function ensures that the clamping system's supporting surface remains clean and free of chips during changeover. Pull-in/clamp forces for each module can be increased up to 45 kN by the turbo function, which comes standard on all but the basic unit. The premium APS system features the ability to monitor the clamping device through air sensing. Over 20 years of engineering experience and expertise went into the development of the APS. It incorporates a compact design that allows for extremely low fixture height. Modular construction means existing clamping systems can be easily modified to utilize APS systems. Up to three clamping slides ensure the clamping device has maximum grip during processing, especially for heavy duty machining applications such as those found in the aerospace and automotive industries. Pneumatic systems are used because they are easier to install, don’t require a hydraulic unit and are cleaner to operate.